This is an example of souvenir ware made by W.H. Goss of Stoke-on-Trent. The company was established by William Henry Goss and produced crested souvenirs in pottery from 1858 to 1939. Their pottery was popular and it was said that by the beginning of the 20th century almost 90% of homes in Britain had a piece of Goss china. 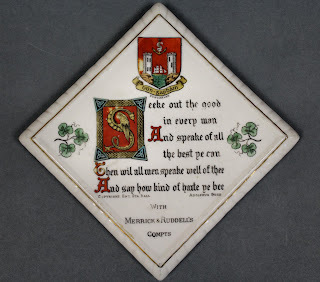 The example illustrated here is hand coloured and contains the Dungarvan Coat of Arms and a verse written by Adolphus Goss. It also has an inscription: With Merrick & Ruddell's Compliments. Goss mark on reverse shows it was made between 1888-1914. Merrick & Ruddell was based on the site of the present Shaws department store in Main Street. Merrick & Ruddell opened their china and drapery shop in 1879.